These stocks aren't without risk, but generous payouts make them attractive to dividend investors. Dividends are an investor's best friend, providing income on top of the potential for capital appreciation. But blindly buying high-yield dividend stocks without regard for the quality of the underlying company can lead to disaster. Thankfully, even with the U.S. stock market not particularly cheap relative to earnings, there are still some good high-yield dividend stocks available. General Motors (NYSE:GM), Mattel (NASDAQ:MAT), and Gap Inc. (NYSE:GPS) all sport dividend yields above 4%. Here's why dividend investors should consider these three stocks. General Motors has greatly benefited from strong demand for automobiles in the U.S. over the past few years. Profits have soared, and the company expects to produce somewhere around $6 in per-share adjusted earnings in 2016. That translates to about $9.5 billion in adjusted net income. GM pays a quarterly dividend of $0.38 per share, good for a dividend yield of about 4.35%. Just 25% of GM's adjusted earnings in 2016 went toward its dividend, a meager payout ratio that suggests that there's plenty of room for the dividend to grow. The story isn't quite so simple, though. Demand for automobiles in the U.S. is showing signs of slowing, and that means that automakers may end up having to spend more on incentives and promotions in order to make sales. GM has already announced some layoffs as demand for sedans weakens. 2016 may end up being the year that GM's profits peak, which means that the true payout ratio is higher than it appears. Still, barring a drop in demand like we saw during the financial crisis, GM should be able to weather the storm. The company is much leaner, capable of breaking even if the annual pace of auto sales drops to 11 million, down from around 17.5 million today. It's impossible to predict GM's exact earnings trajectory going forward, but the dividend should be safe in all but the worst-case scenario. And if GM can maintain earnings better than the market is expecting, the dividend could grow substantially in the coming years. Shares of Mattel have lost about 40% of their value over the past three years, driven down by slumping revenue and profits. This has pushed the dividend yield up, with the stock now yielding about 5.5%. The company is working to turn itself around, moving away from a culture defined by endless meetings and long PowerPoint presentations that were preventing its employees from doing the creative work necessary to come up with new hit toys. Former CEO Bryan Stockton resigned in early 2015 after a disastrous holiday season plagued with issues. Things have started to improve. Sales adjusted for currency rose 2% year over year during the third quarter, and adjusted operating income improved slightly compared to the prior-year period. Mattel's iconic Barbie brand reportedly sold well during the holiday season, providing some good news for the company as it tries to replace nearly $500 million of revenue from Disney princess dolls that it no longer has the license to sell. Analysts expect Mattel to produce $1.28 per share in adjusted earnings in 2016, less than the $1.52 per share in dividends the company paid out over the past year. This will only be a dangerous situation if Mattel's earnings don't recover. Net income has been more than cut in half since 2013, so even a partial recovery will help dividend investors sleep at night. Mattel's dividend isn't as safe as GM's, but those who believe the company will recover are getting a great deal if they end up being correct. Gap Inc., which operates its namesake stores as well as Banana Republic, Old Navy, and Athleta, is in a funk. Comparable sales have been in decline, and profits are down considerably. Fast fashion companies like H&M and Uniqlo, able to go from idea to product quickly, are stealing customers and making life miserable for the struggling mall retailer. 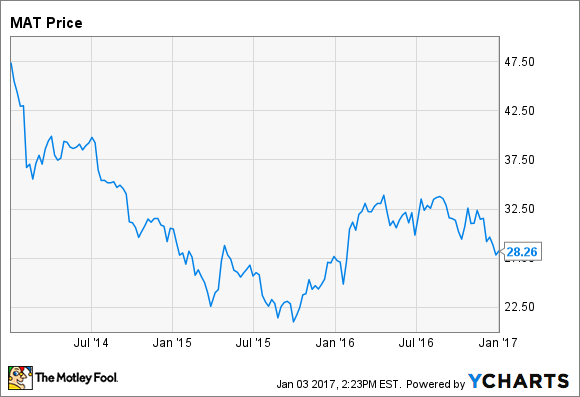 Like Mattel, Gap's dividend yield has soared due to a slumping stock price. The stock currently yields about 4.1%, and while earnings are way down, they're still high enough to more than cover the dividend. Analysts are expecting adjusted EPS of $1.94 this year, putting the payout ratio at about 47%. Gap has a lot of work to do before it will be able to return to earnings growth, so investors shouldn't expect a dividend increase anytime soon. But barring a complete catastrophe, Gap's dividend looks relatively safe for the time being. Earnings may continue to decline, but there's a sizable buffer that should keep those dividend checks coming for the foreseeable future.